Tamara Davis is an astrophysicist in the School of Mathematics and Physics at the University of Queensland. She specialises in interpreting astrophysical observations in terms of their implications for fundamental physics. Her focus is on determining the nature of dark energy – the cause of the acceleration of the expansion of the universe. Davis is leader of the Dark Theme within the ARC Centre of Excellence for All-sky Astrophysics (CAASTRO) and is helping manage the international Dark Energy Survey (DES). 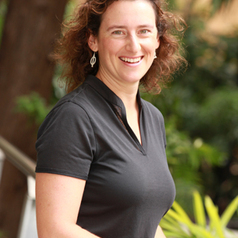 Her achievements were recognised by the Astronomical Society of Australia, which awarded her their prize for the early-career researcher with the highest international impact (2009). She's also received the L'Oréal Women in Science Fellowship (2009), the Australian Institute of Physics Women in Physics Lectureship (2011), the Queensland Tall Poppy Award (2011), a University of Queensland Foundation Research Excellence Award (2012), and the Australian Academy of Science's Nancy Millis Medal (2015). Her research has been highlighted by both Nature and Physics World, firstly amongst Nature's monthly research highlights, and secondly winning 4th in Physics World's top ten breakthroughs of 2011. For good measure, Tamara also has an Arts degree in philosophy, played piano and trombone, has competed at a representative level in six sports, and has won medals for Australia at World Championships for Ultimate frisbee. She is also an avid science communicator, through popular science articles, public talks, radio, and television appearances.